How can I put the mobile STAFFOMATIC version as an icon on my smartphone? 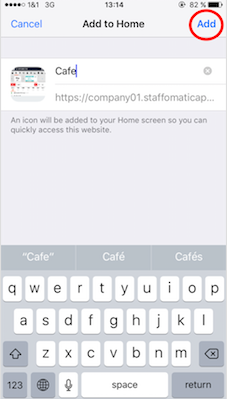 In order to add the STAFFOMATIC mobile version as an icon on your smartphone it takes just three quick steps. 1. Just open your STAFFOMATIC web address on your smartphone browser. Then click on the middle icon in the bottom bar. 2. 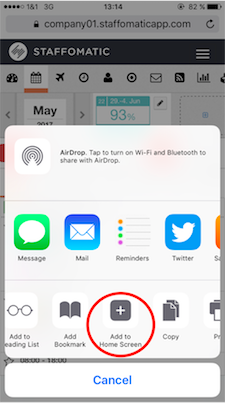 Click "add to home screen" and enter a name. 3. 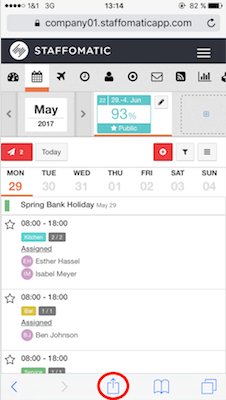 Now just "add" and you can access your STAFFOMATIC directly from your homescreen.